Craft & Vision has released their latest photography eBook by photographer and author Andrew S. Gibson and it’s all about macro and close up photography. As usual it’s $5 unless you use the code CLOSE4 within the next 5 days (by June 24th) to get it for $4. This is a book designed to take some of the mystery out of macro photography and show that it doesn’t take a big bankroll to get started. When I heard this book was going to be released I was excited to get it because at the beginning of the year I purchased the Canon 100mm f/2.8L IS Macro lens as I wanted do a bit of macro photography as well as food photography. As an aside, the Canon 100mm f/2.8L IS macro lens is a phenomenal lens. I’ve used it for everything from portraits, detail work at weddings, product photography and of course macro images of flowers, insects, water drops. Of course as you will learn in this book, you don’t need an expensive lens such as this to get started with macro photography. A macro shot I took with the Canon 100mm f/2.8L IS Macro lens. 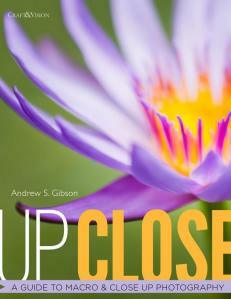 OK, back to the book review, Up Close by Andrew S. Gibson is all about the equipment and techniques of making great macro and close up images. It’s filled with beautiful photos to illustrate the concepts and frankly had me wanting to get out and do more macro shooting. The book is broken out into 3 sections: Equipment, Technique and Lighting. The equipment section is the largest of the book (50 of 90 pages) and talks about macro lenses, close-up lenses, reverse lens macro (mounting your lens backwards), twin lens reverse macro and extension tubes. Andrew goes into great detail dissecting the pros and cons of each solution. I’ll admit I have never heard of close-up lenses (more like a filter that screws onto the end of your lens) or reverse mounting a lens using an adapter. Obviously close-up lenses and reverse mounting lenses is a more economical solution for macro photography and as the author points out provides for great quality as well. It’s all good information for the beginner who is struggling to figure out what options are available. There are inexpensive alternatives to dedicated macro lenses. Part 2 is all about technique. How do you focus? How do you avoid camera shake and create sharp images? 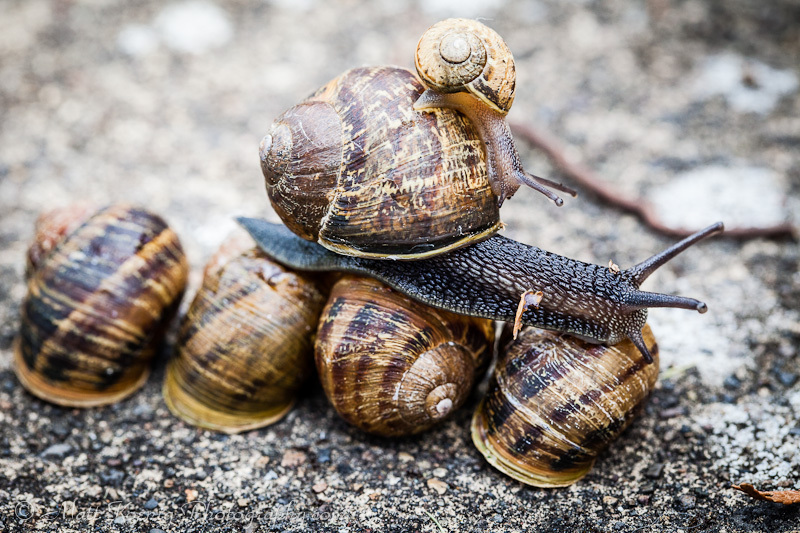 Here’s the thing about macro photography; when you are in close on a subject any little movement of the camera or subject is going to create blur or areas of motion in your image. It’s amplified because of the close proximity. I experienced this when I just started using my macro lens. I would be dialed in on a shot only to discover afterwards that it was blurry. Some of the things that I now do (which are discussed in this book) are to use live view to focus which has the added benefit of mirror lockup when taking the shot. This allows you to dial in the focus and keep the mirror from swinging up and causing vibrations. I also use a remote wireless shutter release so that I don’t even have to touch the camera while taking the shot. The other technique discussed in the book is aperture and how aperture at close focusing distances affects the look of the image and what is in focus and what is not. The third section of the book is on Lighting. Do you use natural lighting or supplement with flash? How does using a polarizer make for better images? There is a great section on using natural light and different ways to diffuse it for great macro shots. There is also a discussion on using flash techniques but there is really no need to purchase a specialized flash for macro photography. The final section of this book contains two case studies of close-up photographers. The first, (Mandy Disher) photographs dreamy images of flowers and insects. The second (Celine Steen) photographs food (one of my favorite subjects). Each offer up their strategy and a few tips for macro/close-up photography and show you that you can take spectacular macro and close up images right in your own home. Overall I enjoyed this book and learned a bit more about macro and close-up photography. If you have already shot macro and close-up work and are looking for more details to take your photos to the next level you will most likely be left wanting more and there are probably other books more suitable to your needs. But if you are a beginner who is interested in learning the basics of this kind of shooting then this would be a great book to start with. You will learn about equipment options, shooting techniques and lighting to get you started experimenting with macro and close-up photography. And you can do it without breaking the bank. You can get your own copy of Up Close at Craft & Vision. Don’t forget to use code CLOSE4 to get it for $4. DISCLAIMER: I am an affiliate for Craft & Vision and do receive a percentage of each sale made through the links above. It doesn’t cost you anything and it helps keep this site going and further my photography. I only recommend products that I have or would purchase myself, or that I think are incredible deals and would be of interest to other photographers. Of course only purchase things that you really feel are a good fit for you.